Glass balustrades not only look impressive and fashionable, but also provide a feeling of additional space. Understandably heavily regulated, to comply with all relevant Australian standards and codes with respect to safety, they can be a relatively inconspicuous adjustment to your home, yielding a very rewarding and satisfying result. 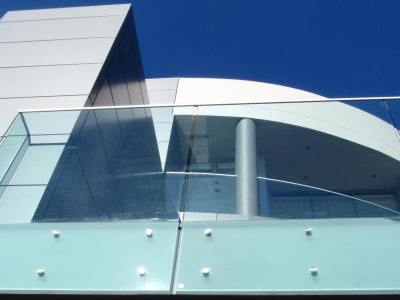 Frameless and semi-frameless balustrades (mini-post or glass clamps) can be installed on balconies, stairs, void areas or used as a privacy screen. Stainless steel parts are all marine grade 316, available in high polish or satin finish, giving you peace of mind against unsightly rust and corrosion that has plagued so many facades as a result of cheap and second rate products. To enjoy an uninterrupted view from your balcony, speak to our design team today about what is involved in upgrading your old-style balustrades, into something stylish and functional. We also do stainless steel wire (or cable) balustrades, as well as wall mounted handrails. Call us now 1300 441 302.